So from my post My Great Grandmother--Carrie E Whitney Harrison, I shared an email I had received from my Grand Aunt Carrie, where she informs me that her grandfather's father's family came from the Azores Islands. Her grandfather was Samuel D Whitney (b.1856--d.1916). Talk about dropping a bomb on someone. LOL. First things first, I had to look on a map to find out where the Azores were. 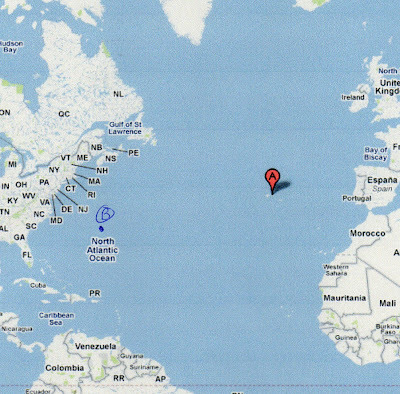 I vaguely knew the islands were somewhere off the coast of Portugal but I had to see where exactly. Point A on Map is the location of the Azores. Point B is Bermuda. The next thing I had to do was see if this could in fact be possible. Why would someone leave the Azores to come to America. Courtesy of RootsWeb.Ancestry.com, I found a post which gave me a reason. Portuguese immigrants to Bermuda began arriving in the 1840's and 50's. Between 1815 and 1850, economic change swept over the Islands as the era of shipbuilding and seafaring came to a close. Slavery was abolished in the 1830's. In 1847 the legislature voted 400 pounds in bounties for those shipping companies that could recruit Portuguese immigrants. Residents of the Portuguese islands of the Azores and Madeira were recruited as cheap labor for farming. B W Watlington Esq sent his vessel the Golden Rule to Madeira, arriving in Bermuda November 1849 with 58 immigrants... 7 children, 16 women, and the remainder men. It was hoped that they would "induce the cultivation of the vine". Also, I found an article by Robert L Santos, California State University, Stanislaus, Librarian/Archivist, called "Azorean Migration" Here is a portion of that article. The major reasons Azoreans left the archipelago are fairly consistent throughout its five hundred years of history and are similar to the reasons for European emigration at large. At first it was an adventuring spirit on the part of those who had wunderlust. Soon though there was overpopulation on the islands which caused starvation and lack of employment. The land tenure system on the islands allowed no opportunity to better oneself which led eventually to mass emigration. Beginning around 1800, the Portuguese government's mandatory military conscription for fourteen year olds and later for sixteen year olds, convinced thousands of young men to illegally emigrate. The discovery of gold in California was the catalyst for thousands more to leave. And earlier emigrants returning to the Azores with talk and demonstration of success (money and material goods) in America enticed others to emigrate. Then there was always the fear of natural disasters which cause still others to leave. So now I have reasons for why they came. Now when do I think they arrived here? That will be in my next post. Thank you for the Geography lesson. This is very interesting and good research as to possible reasons as to why your Great Great Grandfather came to America. Are you related to Eli Whitney? Hi Yvette, so far no I am not related to Eli Whitney if you are referring to the man who created the cotton gin.